PULLMAN, Wash. – Common magnesium chloride deicers used on roadways and bridges around the U.S. may be doing more damage than previously thought, researchers have found. Researchers from Washington State University and Montana State University found that samples of concrete exposed to magnesium chloride in the laboratory with repeated freeze-and-thaw cycles lost more strength than samples exposed to rock salt – even though they showed no visual signs of damage. 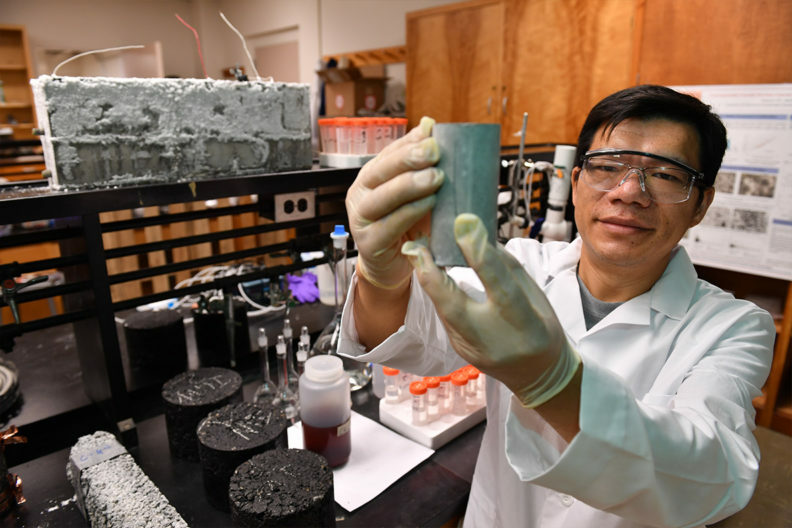 In the study, led by Xianming Shi, associate professor in WSU’s Department of Civil and Environmental Engineering, the researchers were able to unravel how nano-sized crystals form within concrete samples. The formation of these crystals resulted in stress buildup and calcium leaching in the concrete, both of which significantly reduced its strength. In addition to the laboratory observations, the researchers tested sample cores from about 10 Oregon bridge decks that had been treated annually with magnesium chloride. They discovered a significant compromise in splitting tensile strength, which is a property that affects cracking resistance and load-bearing capacity, by as much as 50 percent. They also saw an up to 60 percent reduction in the concrete’s micro-hardness. The worst effects often occurred half an inch to one inch inside the sample, instead of on the concrete surface. Shi compared the chemical’s invisible degradation and concrete softening to what happens with aging osteoporotic bones.